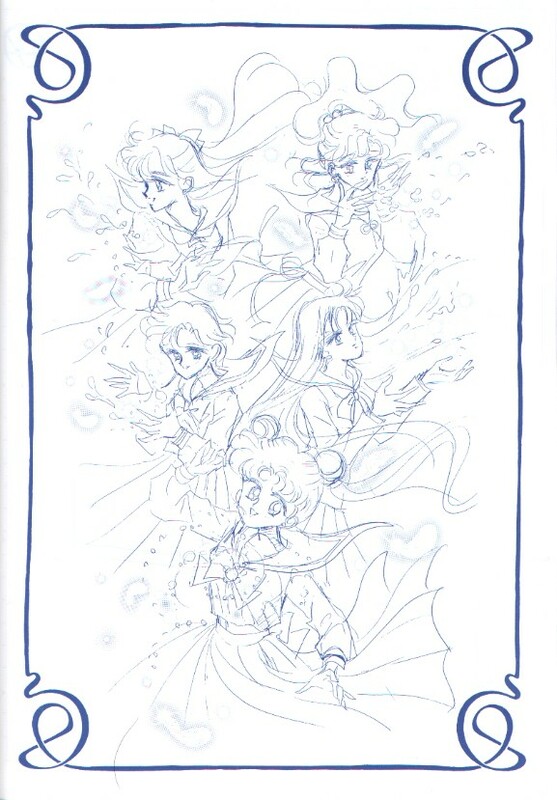 This hardcover tribute artbook was self-published by Naoko Takeuchi as a doujinshi on June 30, 1997 and distributed in small numbers at Japan’s Comiket Summer 1997. 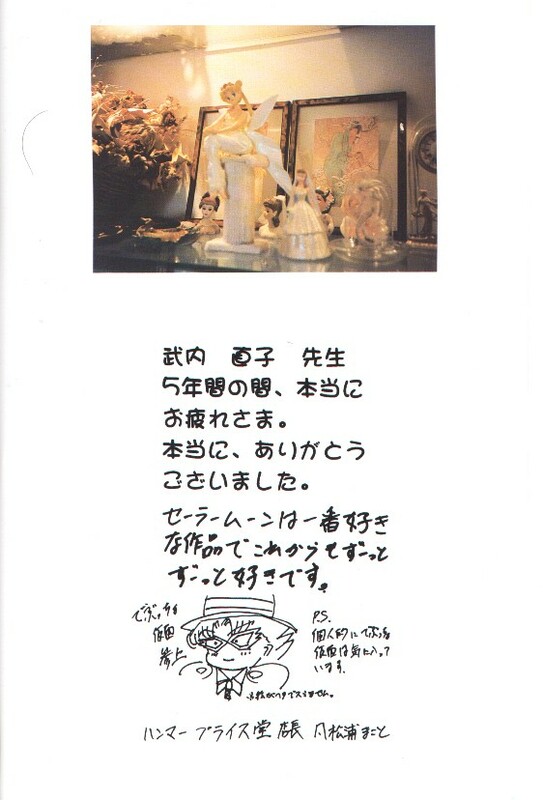 The Japanese characters for “Original Picture Collection” appear on the cover but “Memorial Picture Collection” is printed in English in the back of the book. 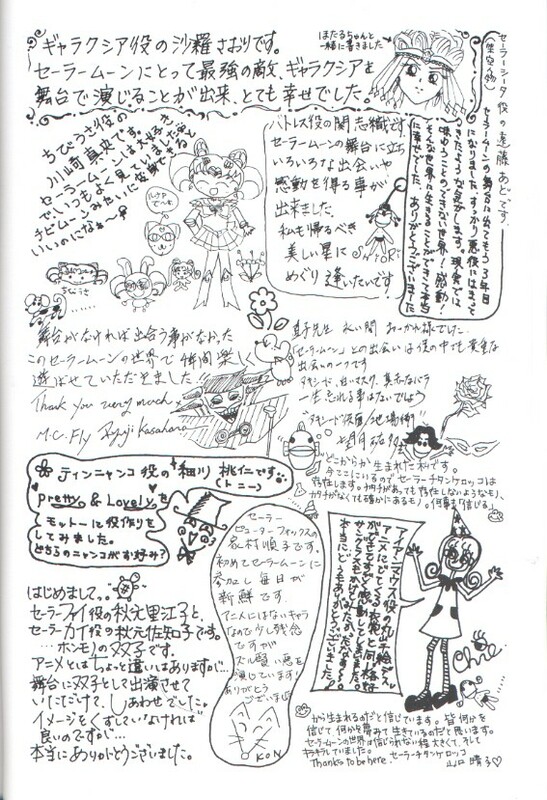 Liner note translations are from the defunct fansite mahoushoujo.net. 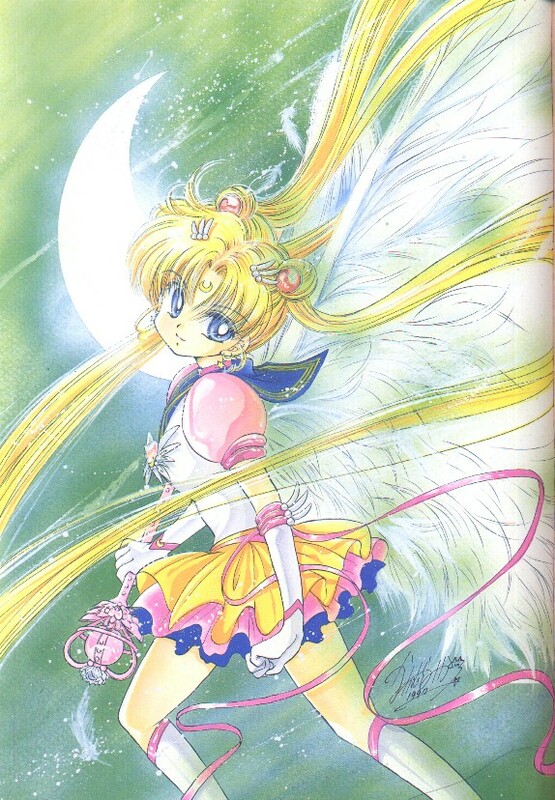 Art by: Takeuchi Naoko, the original creator of Sailor Moon. 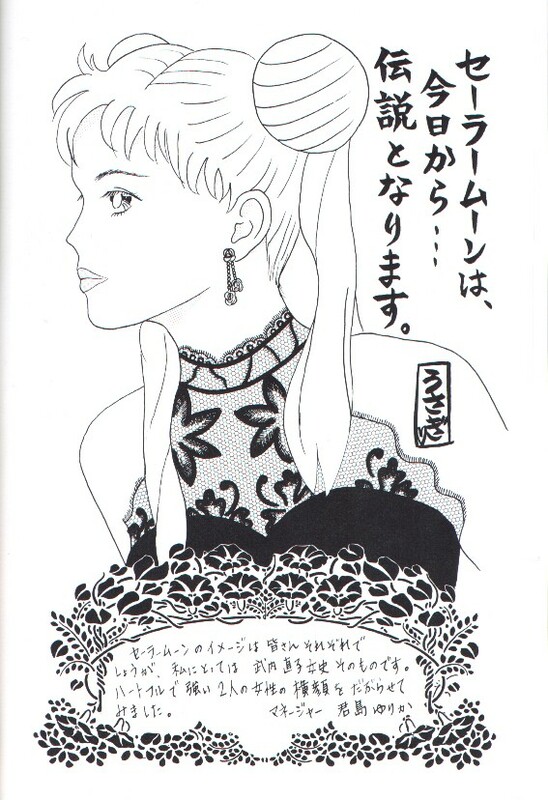 Art by: Tadano Kazuko, the original character designer of the Sailor Moon anime. 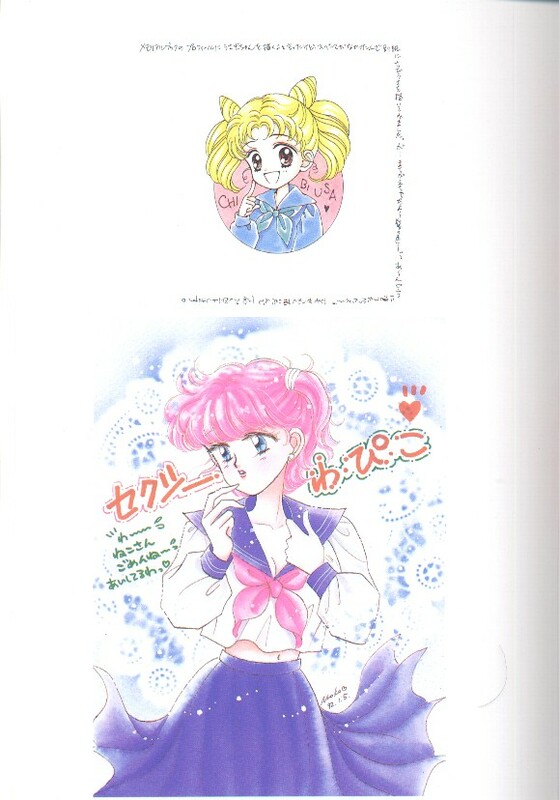 Art by: Matsushita Hiromi, key animator of the Sailor Moon anime. “Since I met you, I put a great energy into you. And I got a great energy from you. Thank you. I love you too much for words. 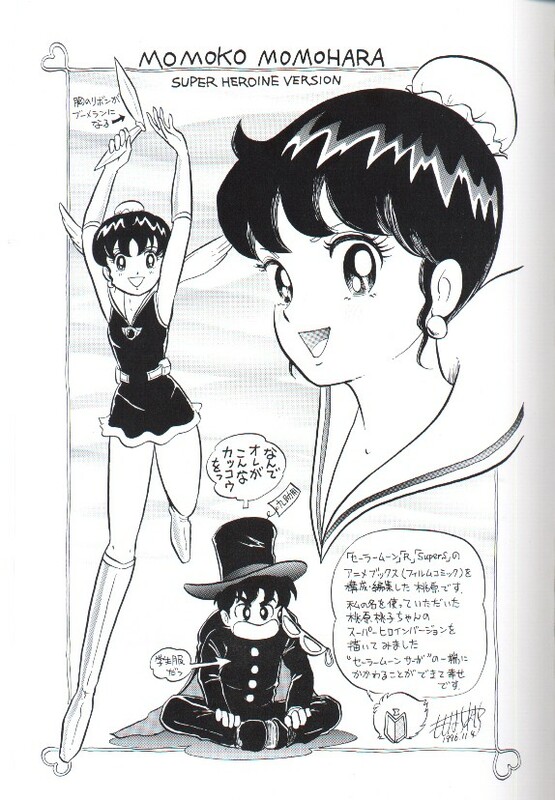 Art and Text by: FURUYA Toru, voice for Mamoru. I’ve been doing a fine job for a long time!! Ami-chan gave me a lot of encounters and works. I was raised by Ami-chan. I was really, greatly happy to meet Ami-chan. Art and Text by: TOMIZAWA Michie, voice for Rei. 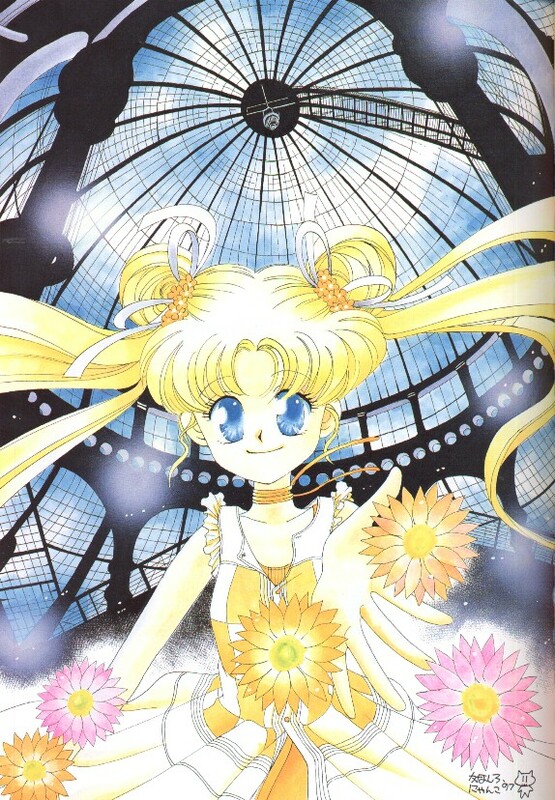 “The work “Sailor Moon” was exactly like “magic” for me. 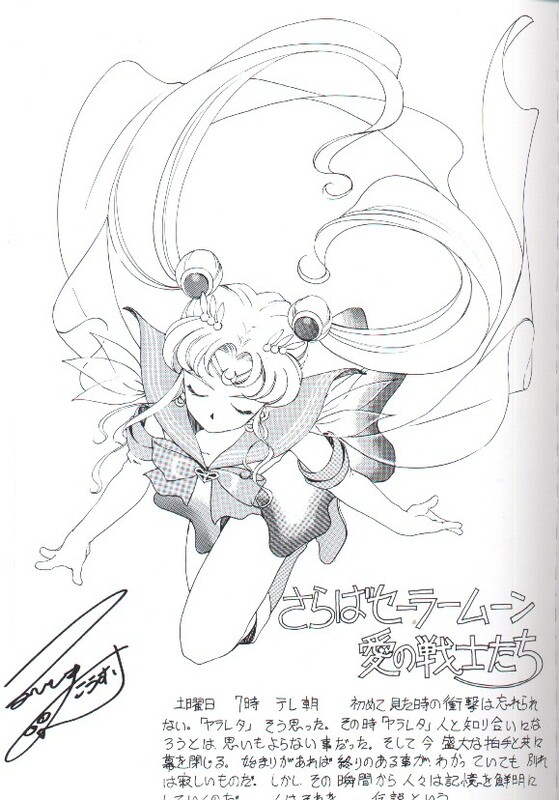 “First the original creator Takeuchi Naoko-sensei, all the staff, all the actors… and all the fans supporting for a long, long time, I, now again, am full of my thanks. 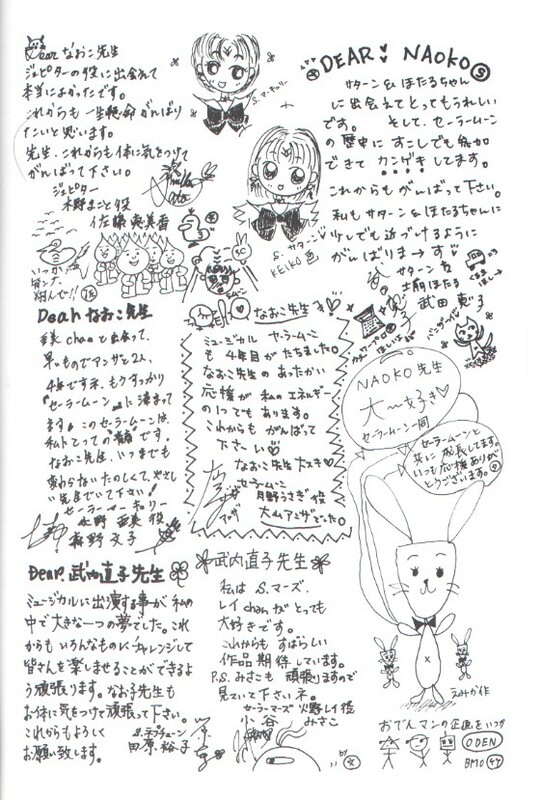 Text by: SHINOHARA Emi, voice for Makoto. 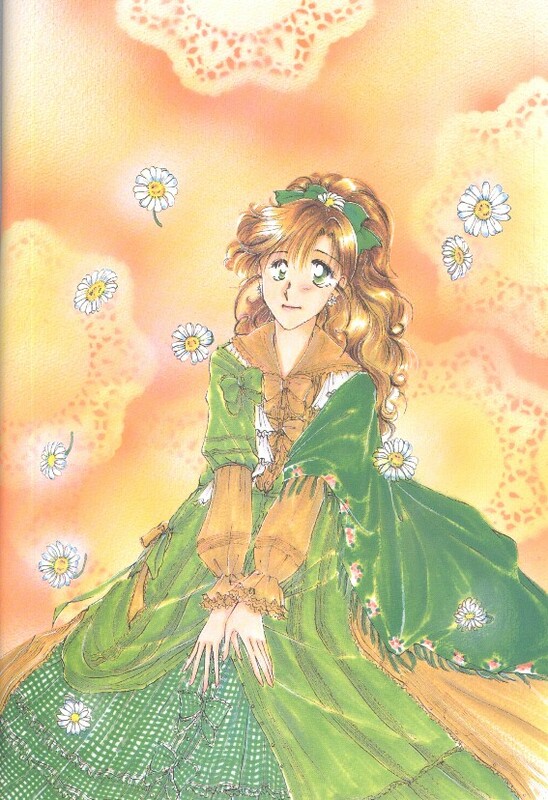 Art and Text by: FUKAMI Rica, voice for Minako. 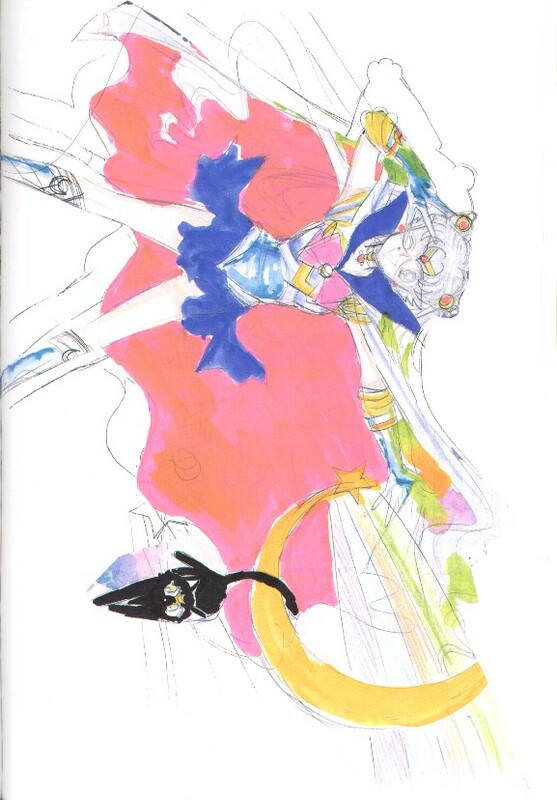 Art and Text by: Megumi Ogata, voice for Haruka and Petz. 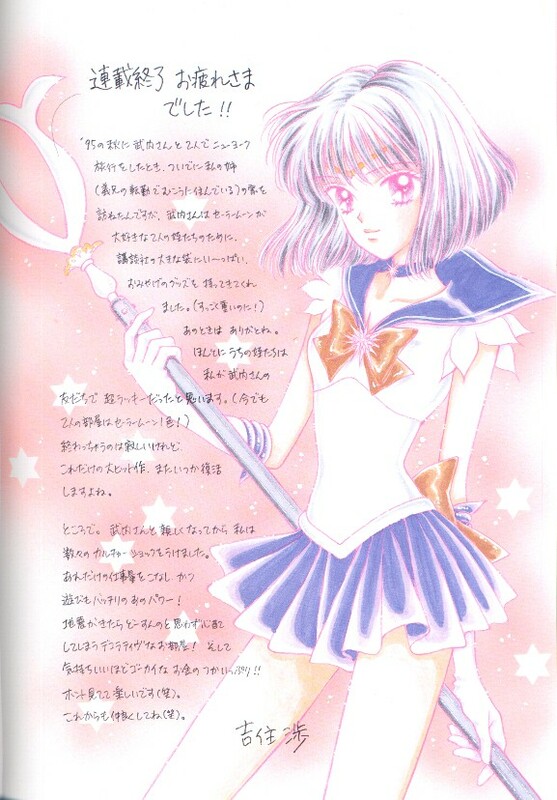 Art and Text by: Masako Katsuki, voice for Michiru. 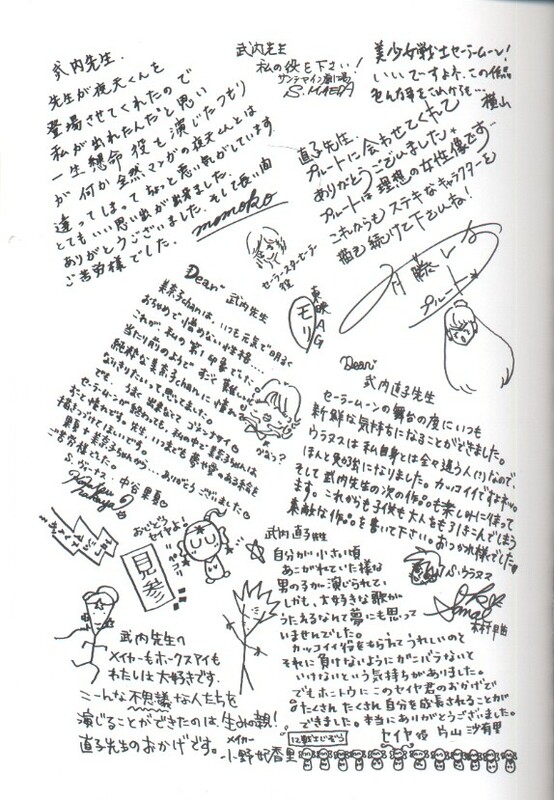 Art and Text by: Chiyoko Kawashima, voice for Setsuna. 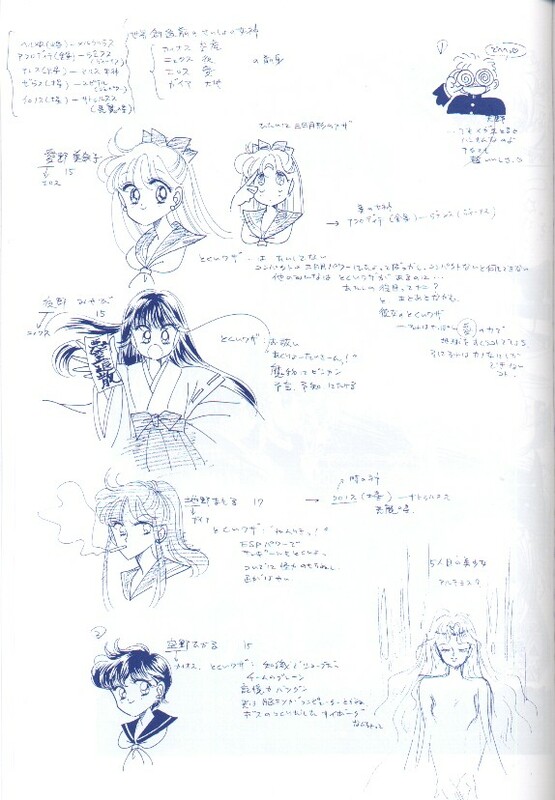 Art and Text by: Yuko Minaguchi, voice for Hotaru. 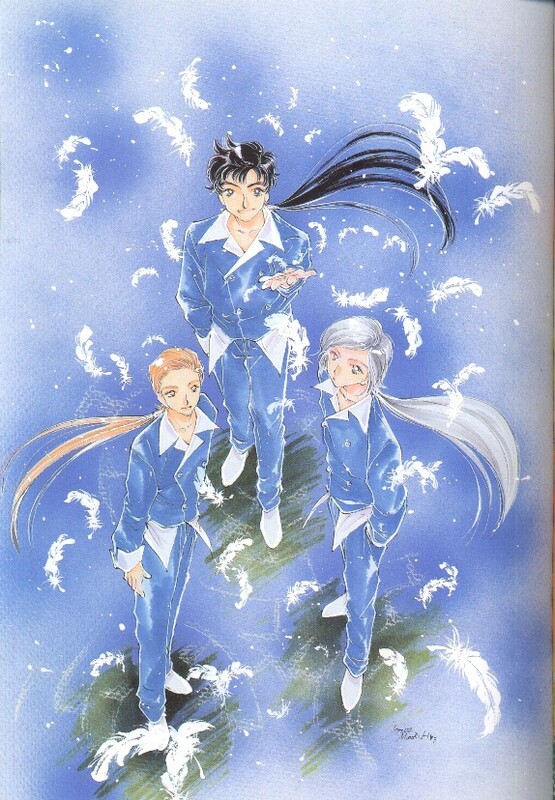 Art and Text by: Keiko Han, voice for Luna and Beryl. Art and Text by: Jiina Kyoto, graphics designer. You’ve been doing a fine job for such a long time. After you take enough recreation, please make a good work again! Art by: Aya Kadoi, illustrator, original character designer of the video game “Kakyuusei”. “When Takeuchi-san and I took a trip to New York in fall ’95, we visited my sister’s house (who was living over there due to my brother-in-law’s business). For the two nieces of mine who loved Sailor Moon, Takeuchi-san took a whole bunch of merchandises as souvenir for them in a large bag of Kodansha (Even though it was very heavy!) Thank you for that time. I really think it was super fortunate for my nieces that I am Takeuchi-san’s friend. 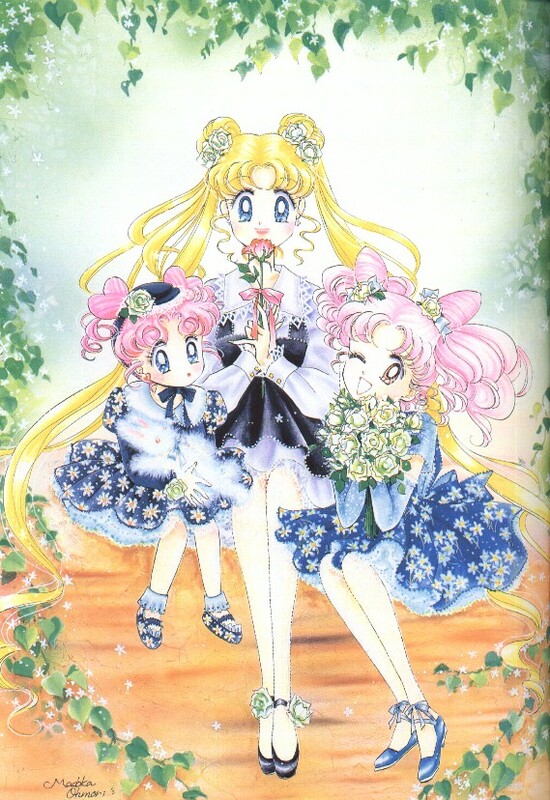 (Still their rooms are all full of Sailor Moon!) It’s sad that it’s ending, but it’s such a big hit that it sure will revive again some day, right? 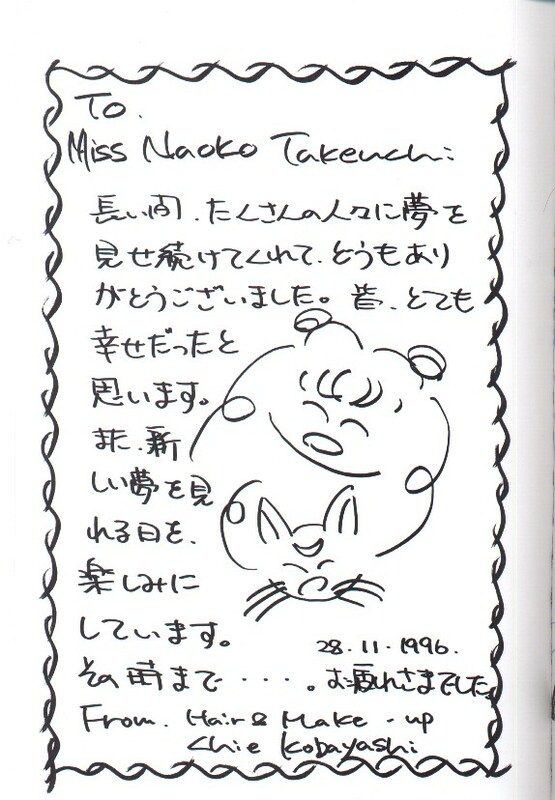 Picture: in the living room of Naoko Takeuchi’s house. 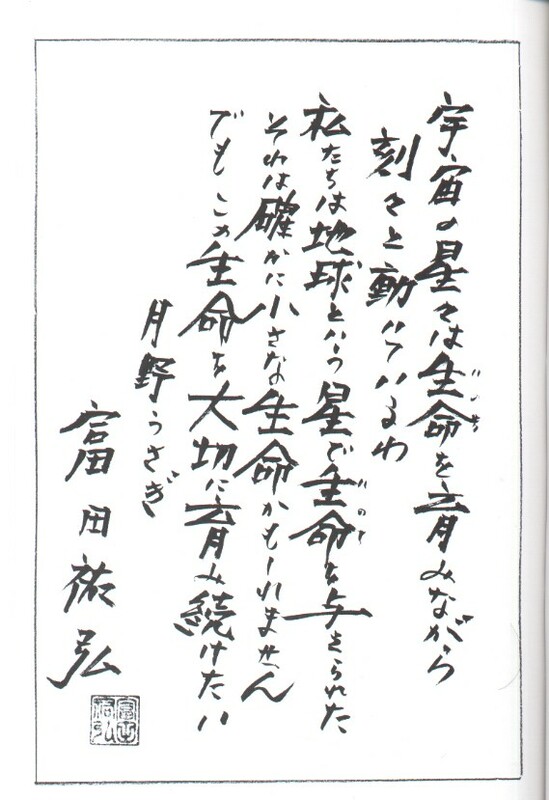 Text by: Makoto Hanmatsuura, the insane guy who won a bid for the right to appearing in the Sailor Moon manga as himself in a TV show of charity auction for Kobe Earthquake Disaster. The bid price was 2 MILLION YEN!! 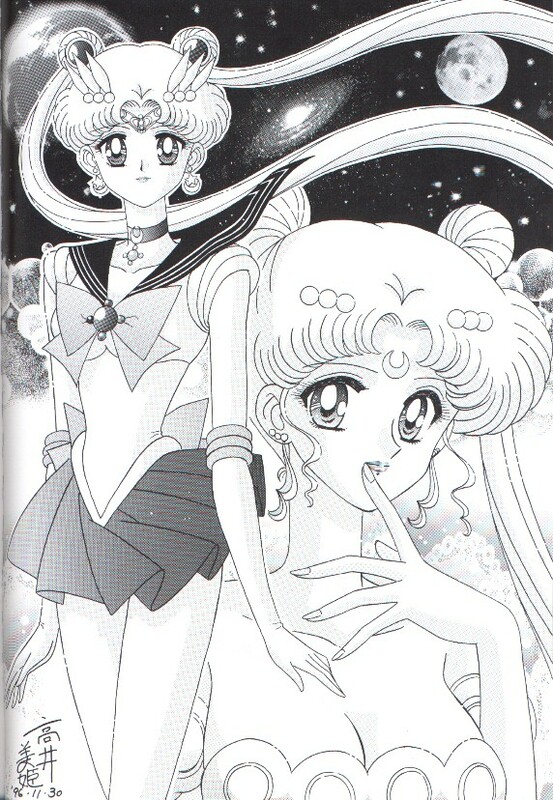 (About $20,000) Check out the Sailor Moon manga Vol.17 pp.131-169. 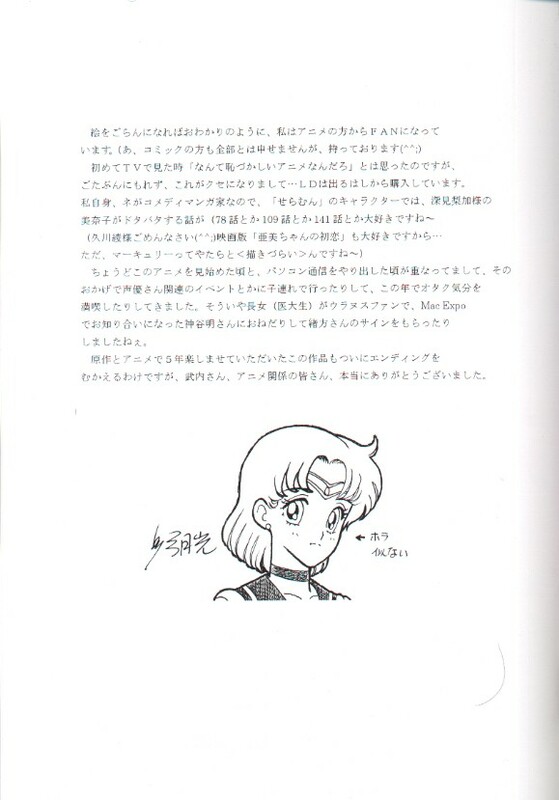 Text by: TOMITA Sukehiro, writer, scenario writer of the “Sailor Moon” anime, “Macross”, etc., the original creator of “Wedding Peach”. “You’ve done a fine job on Sailor Moon!! 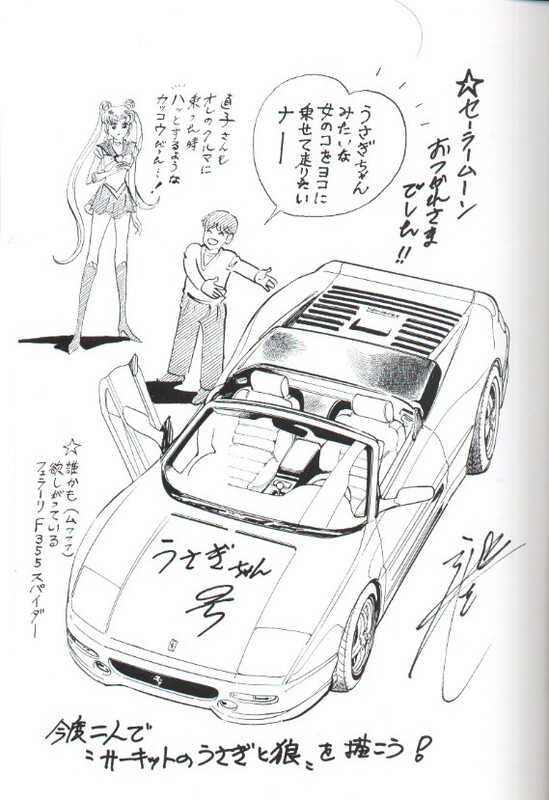 I want to drive with a girl like Usagi-chan in the next seat! When Naoko-san rode in my car, her looking took my breath away…! You’ve done a fine job on the long serialization. I’m looking forward to your next work. 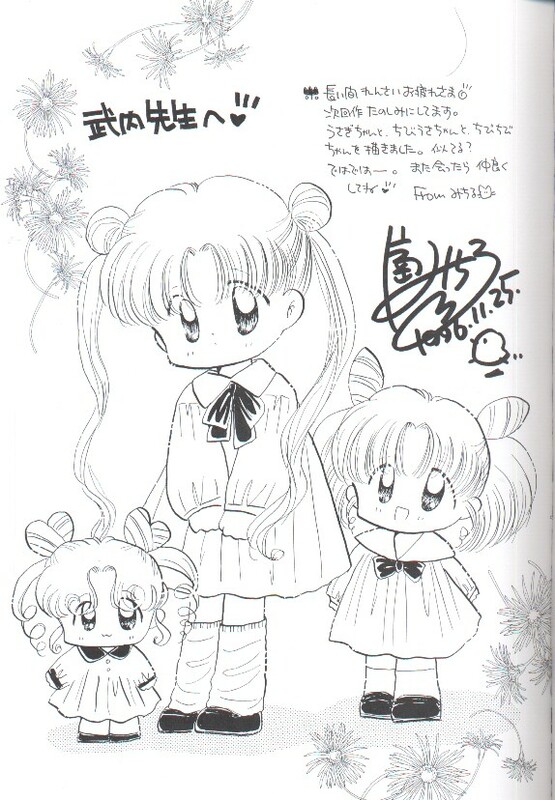 I drew Usagi-chan, Chibiusa-chan, and Chibichibi-chan. Do they look like them? See ya! When I see you next time, please be a good friend, okay? 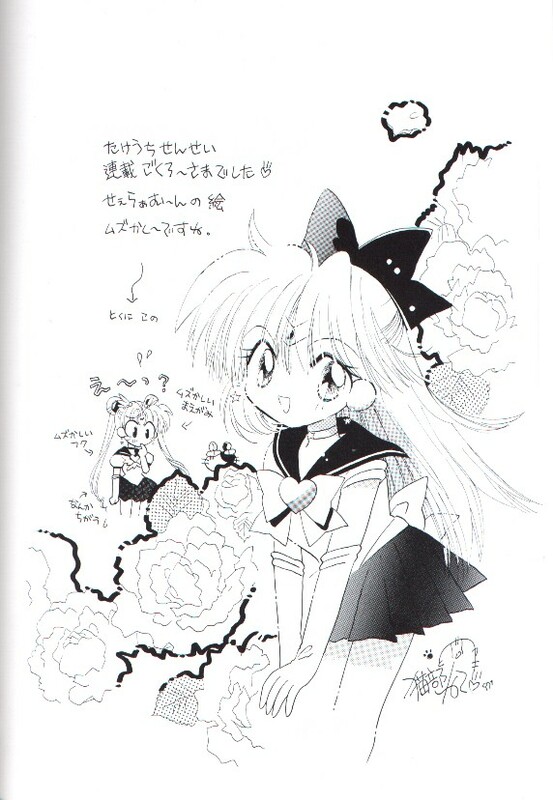 Art and Text by: Marie Koizumi, novelist, creator of “Mermaid Panic”, etc. You’ve done a fine job on the serialization!! Drawing Sailor Moon is so difficult. 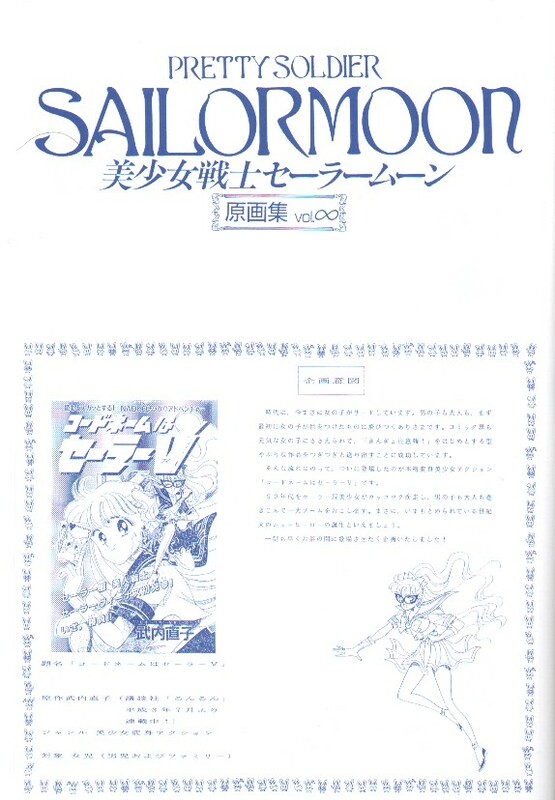 In a tide like that, what has finally appeared is the full-dress transforming pretty girls action “Codename wa Sailor V”. 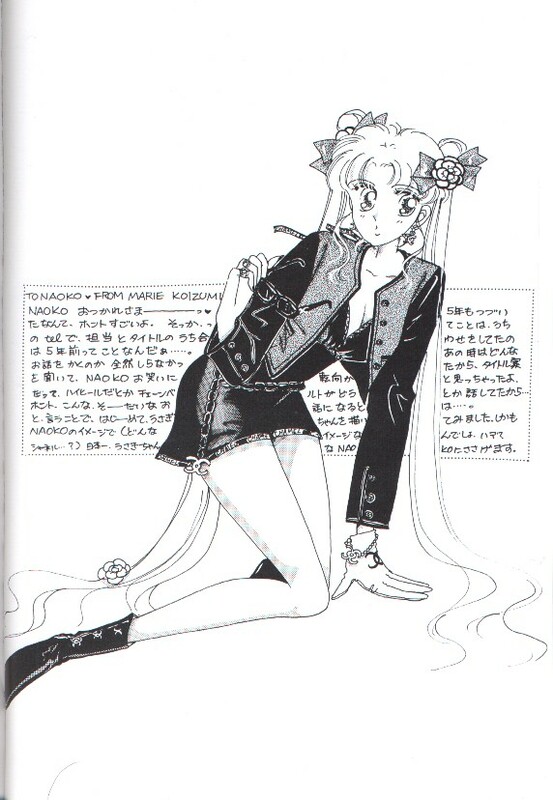 Sailor suited pretty girls will heroically drive the 90s, and they will come in mode, also involving boys and adults. We can say that this is the birth of a new hero of the end of the century that has been longed for. 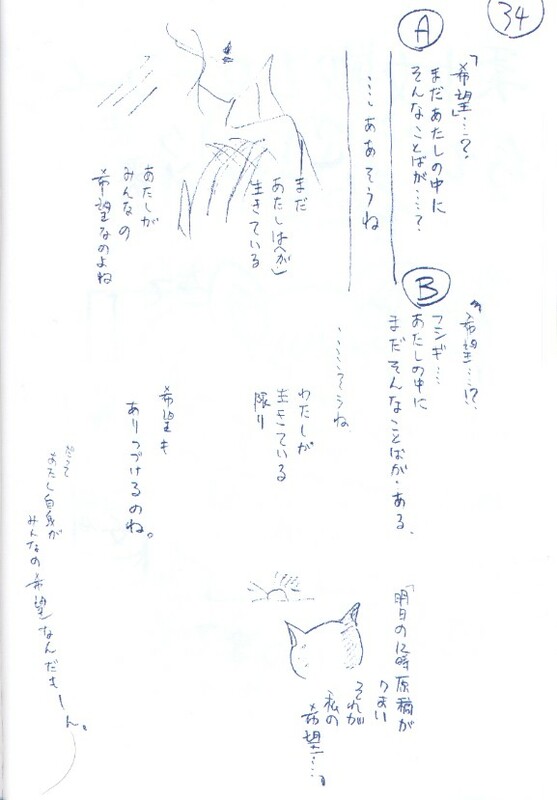 [Text is untranslated, but it is shown on this page that in the original proposal, there was no Usagi. 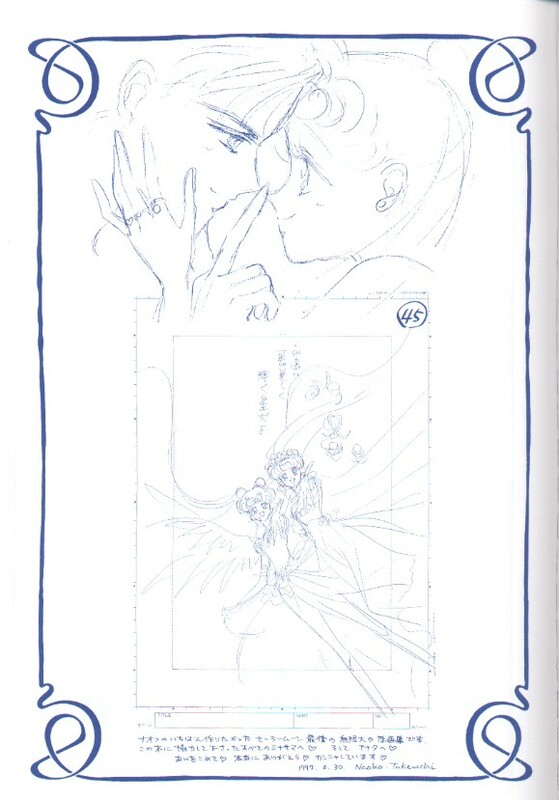 Sorano Hikaru and Amano from “Sailor V” appear. Rei’s name was “Yoruno Miyabi”. 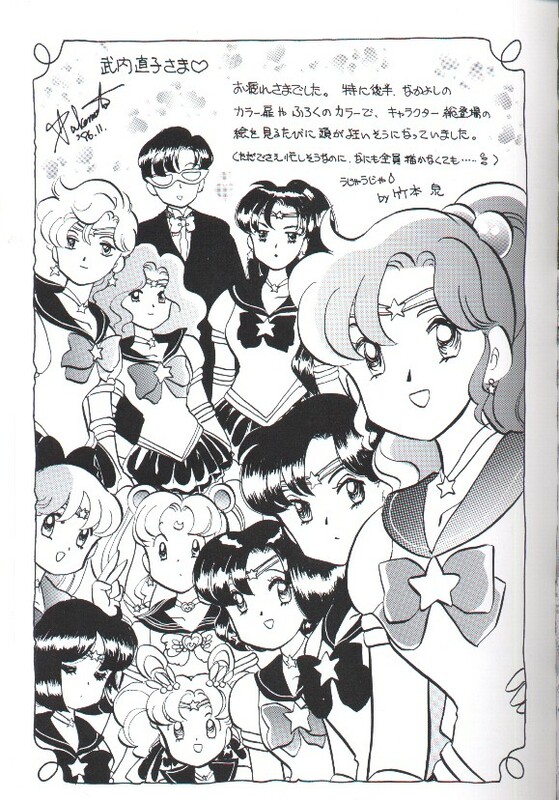 Makoto’s name was “Chino Mamoru”, and the fifth girl’s name was “Artemis”. 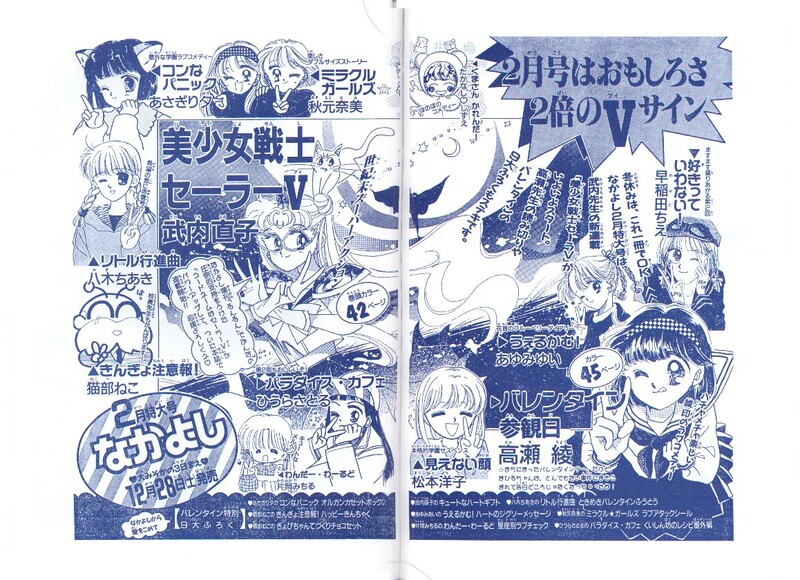 Preview pages of the next issue in the January ’92 issue of “Nakayoshi”. 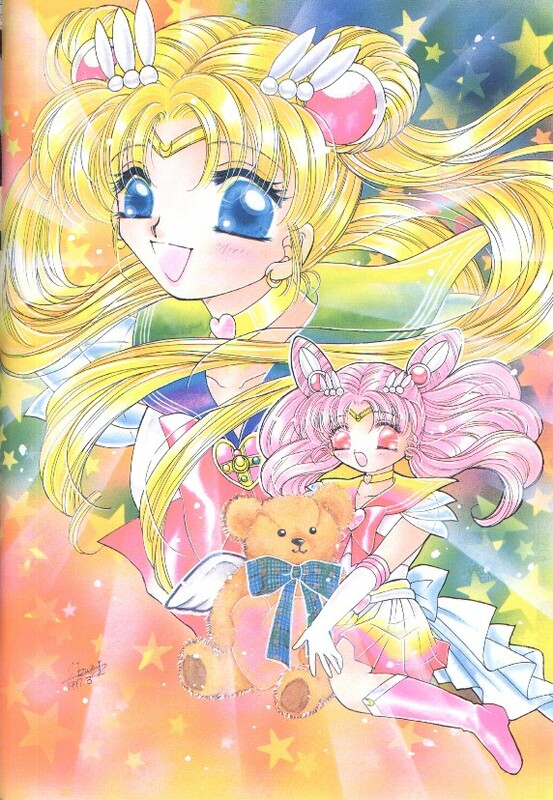 There have been some changes: that the girl is now Usagi, the cat is Artemis, Usagi’s outfit looks like Sailor V’s, and the name of the manga is “Bishoujo Senshi Sailor V” [Pretty Soldier Sailor V]. These had changed by the time the first chapter appeared, in the following month’s issue. 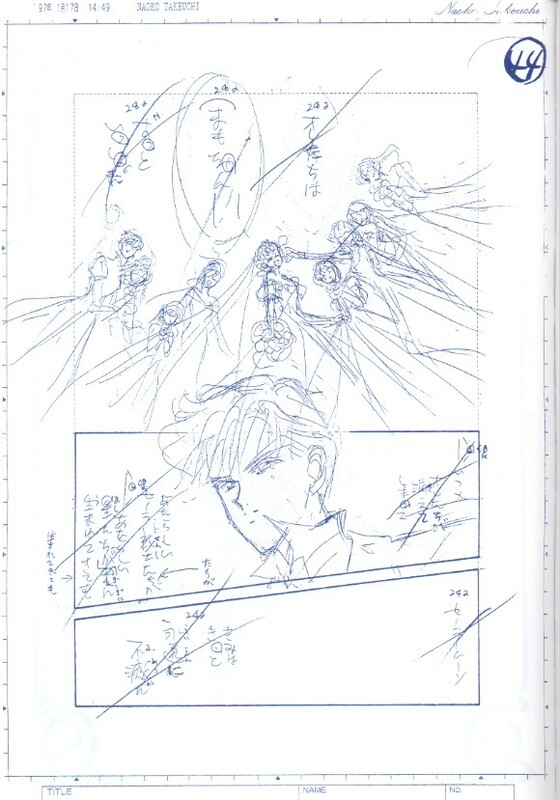 A rough draft of the final chapter of the Sailor Moon manga.